By Scott Gilfoid: Tim Bradley likes Errol Spence’s chances of going into the UK and beating IBF welterweight champion Kell Brook (36-1, 25 KOs) in their upcoming fight. The date of their fight hasn’t been confirmed, but the latest news is that it’ll take place on either May 27 or June 3 in Sheffield, England. The way I see it, Brook is showing a lot of courage in choosing to face the multi-talented Spence, given that he’s viewed by many as the next star at welterweight. Brook could have vacated his IBF title to avoid Spence and used his recently injured right eye socket as excuse to swerve him. Brook chose interest to stubbornly hold onto his IBF title, so now he’s facing what could be another knockout loss when he gets inside the ring with the 26-year-old Spence. Bradley sees Brook as having a hard time with Spence. Bradley thinks it’s going to be difficult for Brook to melt down to the 147 pound limit for the fight. Brook fought at middleweight in his last fight in September against IBF/IBO/WBA/WBC middleweight champion Gennady Golovkin and was stopped in the 5th round. Brook got a big payday out of the fight, but he paid a heavy price in suffering a broken eye socket. Bradley says it’s going to be really tough on Brook to have to make weight at 147 and face a dangerous guy like Spence, who he admires. Bradley says that Spence is a “Dark horse.” In other words, a little known fighter that is on the verge of becoming a big star in the 147lb division. Spence has been moved slowly by his promoters. He probably should have been at this stage a long time ago, but his management took their time with his career. Hopefully if Spence beats Brook, he can get other big fights such as a unification against WBA/WBC welterweight champion Keith Thurman. “Errol Spence is going to do something to him,” said Bradley about Brook to Fighthype.com. “He might get caught again. 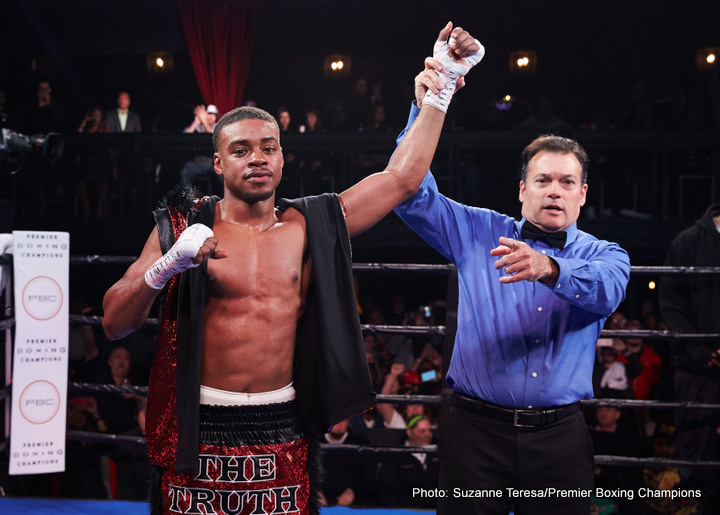 Errol Spence is like the dark horse. He’s like the dark knight in the welterweight division. The other guy [Brook went up in weight, so it’s kind of hard. Now he’s got to drop back down, and he’s a big guy anyway, Kell Brook. He could have a hard time making weight too. He [Brook] got touched and his corner stopped the fight [against Golovkin] and he didn’t allow him to take too much of a beating. He got hit hard and he got his orbital bone messed up. Coming down to fight a guy like Errol Spence, who punches hard to the body and punches hard to the head,” said Bradley. I do agree with Bradley that Spence is going to do something with Brook. I think he’s going to knock him out. Brook is supposedly fit to fight after having surgery on his broken right eye socket from the Golovkin fight. It’s probably not the smartest thing for Brook to have chosen to defend his IBF title against Spence rather than taking on a soft opponent with less power. It would be bad if Brook suffers another broken eye socket. When you’re facing a fighter with the kind of power that Spence possesses, it could be a really bruising night for Brook.